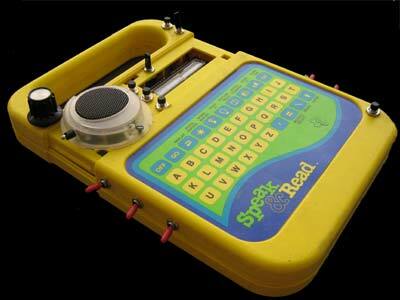 Speak & Read Circuit Bending! ALIENS SPEAK FROM INTERGALATIC SPACE!!! ! Circuit bending classics!!! Normal Mode All normal fonctions of speak and read!!!! 1 pitch control / “crashed limit” Pitch and makes speak and read totaly glitch!!!!!!! 1 darth vader toggle switch ( combined with other toggle switch ) to make infiny glitchs! 1 special flux toggle switch ( combined with other toggle switch ) to make infiny glitchs! 1 panic bouton button to reset the speak and read and play live musicaly! !